Just as parents take their children to the dentist for regular check-ups, children are treated to ensure proper spinal development. 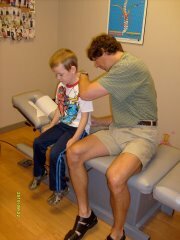 Dr. Kjaer, Victoria Family Chiropractor, has been treating children for over 25 years! Watch this short video titled “Dr. Kjaer: Children’s Chiropractor” to see why pediatricians, medical doctors and families from southern Vancouver Island refer children to him. They trust that he can help! The musculo-skeletal system of an infant or child is very sensitive to stress or unusual positions. The birth process may cause spinal segments to be pushed out of place or jammed. Research has shown that problems early in a child’s life can come from birth trauma to the spine. This could include unexplained crying, colic, and bed-wetting. Chiropractic care has been shown to benefit some non-musculoskeletal conditions such as these. Spinal problems can also occur as a result of the frequent bumps suffered by infants in the first months of life: a fall from a bed, a sudden stop in a car or an unsupported movement of the head and neck. Other causes of repetitive stress include: babies spending time constrained in a baby carrier; infants placed in weight-bearing positions with baby bouncers or walkers when their lower limbs, pelvis or lumbar spine are not developed enough to bear weight; and stomach sleeping. As children grow up they constantly expose their developing spines to stressors: simple falls as they learn to walk, a fall from a bike, time in front of the television or computer and poor posture. Perhaps the most serious threat to the child’s spine is the use of backpacks. Read more about the proper use of backpacks under “health tips”. Parents often presume that children and teenagers are resilient and do not need help after their falls and accidents. The fact is, their spines are subject to greater stress and damage since their bodies are not yet completely developed. These pains, signs and symptoms – at any age – are a sign that something is wrong. Other health care professionals may not be aware of the stresses children are constantly exposed to. It is difficult for parents to recognize when a child has suffered from some repetitive stress. Dr. Kjaer, highly trained in evaluating the spine, can determine if a child has a problem. By the same token, it is difficult for someone other than a dentist to know if a child has a cavity. Above all else, we ensure that the experience is fun and relaxed for both child and parent. The first step in the process is for Dr. Kjaer to consult with the parent and child and then conduct a careful and thorough evaluation of your child’s spine. Treatment is provided to babies and children of all ages – from only days old to adolescents and is modified to fit your child’s size, weight and unique spinal problem. Go to our facebook page to see just some of the kids we help at our busy office. Seniors receiving chiropractic care from Dr. Kjaer also have their treatments modified to suit them. After all, each patient is unique. Spinal treatments for infants and young children involve finger tip pressure to correct malfunctioning spinal structures and restore mobility. This may ensure the proper spinal development of your child. Ultimately, they grow up to be stronger and avoid many of the chronic problems their parents suffer from. Recall the adage: “as the twig is bent, so grows the tree”. We encourage you to have your children’s or grandchildren’s spines checked by Dr. Kjaer. Either to recover from a recent injury or to ensure proper development so chronic weaknesses are avoided later in life. Remember, there may be no symptoms at all to indicate a problem or weakness. Change the lives of those you love! Call Dr. Kjaer at 250-477-4702 for an appointment.